PSYCHOACTIVE SYNTHETIC DRUGS are being smuggled into Irish prisons in what is being described as a “worrying trend” by prison officers. In one case in recent weeks, it took six prison officers to restrain one man who was convulsing on the ground and attacking officers who tried to come to his aid. The once legal drug ‘Spice’ is also becoming an abused substance in Irish prisons. However, the effects of this drug leaves prisoners in docile state, although they are usually passed out or incomprehensible. The synthetic cannabis has seen on the streets of Manchester which are now populated by ‘zombie-like’ Spice addicts and the trend has travelled across the Irish Sea and is becoming a serious issue for prison officers. However, it is not yet at the same scale which is seen in prisons in the UK. Spice is a form of synthetic cannabis of the kind formerly sold in Ireland’s ‘headshops’ before legislation cracking down on ‘legal highs’ was introduced here in 2010. Gabriel Keaveney, Assistant General Secretary of the Prison Officers Association (POA), has said that the use of the synthetic drug is causing a lot of problems for officers around the country’s prisons. “We have had guys absolutely off their heads on the stuff. There were a couple of very serious incidents recently. In one case, it took a large number of prison officers to subdue a man who was quite clearly high on drugs. He was brought to hospital and they had to use an anesthetic to calm him down he was that bad,” Keaveney said. Another problem with these synthetic drugs is that the sniffer dogs have not been trained to detect them. Keaveney believes that officers should carry out intelligence-led targeted searches of those visiting high-risk prisoners instead of the “blanket cover searches” they conduct now. A spokesman for the Irish Prison Service (IPS) said they are aware of people using the drugs in Irish prisons and are monitoring the situation. There would be some occurrences of people using these drugs here but it would not be very often. We would be aware of it. It’s a big deal in the UK and once something starts happening in the UK, it usually ends up over here too. The situation is being monitored very closesly by the IPS. 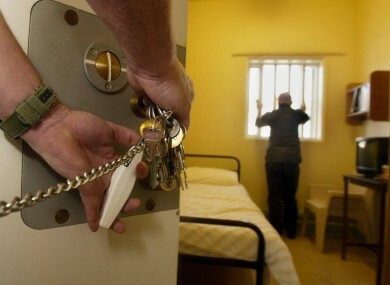 Jim Mitchell, Deputy General Secretary of the POA said their members work in an environment where others use drugs on an ongoing basis and there is an ongoing concern about the passive effects on prison officers. “Drug use is part and parcel of prison life for some prisoners, despite our best efforts to deny access at entry points through searches and the use of electronic systems. We must face the reality of drug use in our prisons and take some action. The IPS have a responsibility in this and we expect they will enter meaningful discussions in the coming weeks”. As TheJournal.ie reported in December, the Spice drug is referred to on the streets as ’moonshine’ – essentially synthetic cannabinoids sold in rock form. The rocks are sprayed with the synthetic cannabinoid and then with a solvent, and then smoked. Other problems linked to an increase in use of some former headshop drugs have also been reported in recent years. A drug known as ‘Snow Blow’, for instance, was linked to a HIV surge in Dublin in 2015. “Synthetic Cannabinoids have been available in Ireland for some time now,” Tony Duffin of the Ana Liffey Drug Project said. There is an increasingly wide array of unknown or illicit drugs being used every day in Ireland. Opioids, Stimulants, Empathogens, Psychedelics, Dissociatives, Cannabinoids and Depressants are all easily available and cheap to buy. This is mirrored in the UK. Duffin continued: Across all jurisdictions there is a need for increasingly progressive drug policies that can better manage drugs in society – to reduce harm to individuals, families and communities. Email “'It took six officers to restrain him': Psychoactive legal highs are creeping into Irish prisons”. Feedback on “'It took six officers to restrain him': Psychoactive legal highs are creeping into Irish prisons”.